Safavieh Rural Woven Dining Ilya Grey Wicker Dining Chairs (Set of 2) - 17.3" x 24" x 39.3"
Safavieh Rural Woven Dining Arjun Antique Grey Wicker Dining Chairs (Set of 2) - 18.1" x 13.2" x 40.1"
Safavieh Rural Woven Dining Arjun White Wicker Dining Chairs (Set of 2) - 18.1" x 13.2" x 40.1"
Safavieh Rural Woven Dining Ilya Brown Multi Wicker Dining Chairs (Set of 2) - 17.3" x 24" x 39.3"
Rich in designer details, this transitional set of two antique grey wicker dining chairs adds a luxury look to dining rooms, kitchens and casual spaces. Crafted of rattan with contrasting legs and accent bands on seat backs of hardwood in a dark mahogany finish. Estimated assembly time: 5 minutes. I was hesitant because I ordered "grey" wicker blinds and they were anything but grey. The chairs are truly grey and the seats are reinforced, very satisfied. Love these chairs. They are well made and comfortable. They are gray and tan with black legs and a black wooden accent at the top. They are a beautiful addition to my dining area. I love the color of these! Not your typical wicker chairs! I purchased 4 for my breakfast table. They match perfectly. 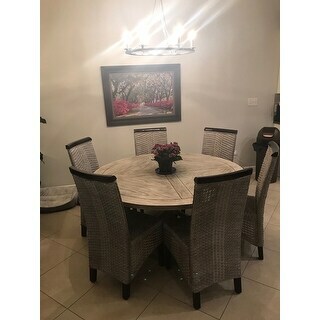 I'm a female with arthritis and I assembled these chairs myself, wasn't very difficult at all. My reason for taking a star off is that every single chair has a wobble. I've tried to adjust the feet to keep them from wobbling, but to no avail. Luckily, we don't use them very often or I would put more effort into fixing that issue. Otherwise, an affordable, lovely set of chairs. These chairs are a beautiful addition to my kitchen and they are very comfortable to sit on for long periods of time. The grey color paired with the dark ebony color has a very warm look. They are well built and will hold over three hundred pound person according to the specification provided. These chairs are stunning. The woven material has an expense look. The black legs and wooden header is a high gloss lacquer giving these chairs a designer appearance. Purchased two sets.... Thinking about purchasing one more. Was not disappointed, very consistent color patterns w/ all four chairs. Durable and most of all they are pretty comfortable. Definately recommend! These fit my nautical/lake theme perfectly. High quality and easy to put together. I now have 8 of these to finish off the look. I paired these with a farm table and get compliments often. I also purchased chair cushions to finish off the look. Just simply beautiful chairs. The color of the wicker is perfect light gray. They will look amazing with the black table purchased also on Overstock. Bseatiful chairs. matches with my decor perfectly..fast delivery service. Love the chais. They look great in our kitchen. They look just like the ones in the picture. No complaints only enjoyment! "Could you please tell me what the height of the seat is on these chairs?" The height of the seats on this chair is 18.8”. "I bought 3 sets of these chairs. Four of the chairs have the gray affect to them. Two of the chairs are brown. It looks like the grey was an additional step in the finish that didn't get done to 2 of the chairs. How can I get these replaced?" "What size cushion fits this chair?" Hello Bruce C., the seat is approximately 17.3 inches wide x 16.5 inches deep. We recommend a cushion approximately 17 inches wide x 16 inches deep. Thanks for shopping with us! 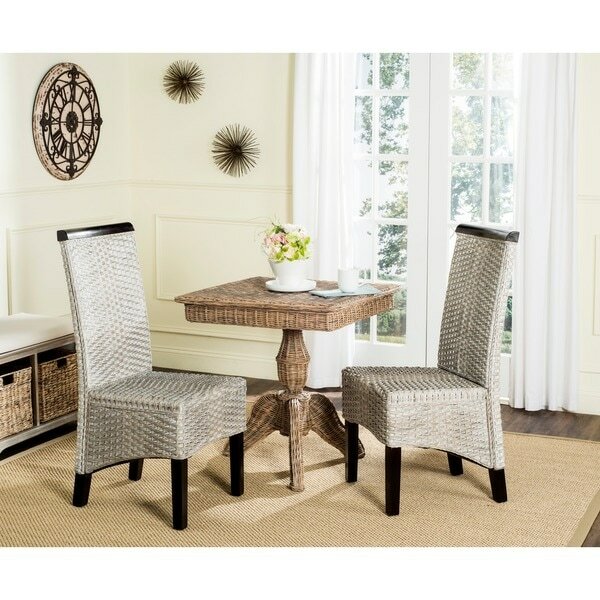 Safavieh Rural Woven Dining Arjun Grey Wicker Dining Chairs (Set of 2) - 18.1" x 13.2" x 40.1"
Safavieh Woven Beacon Unfinished Natural Wicker Dining Chairs (Set of 2) - 19" x 24" x 38.5"